The green-minded aleady have plenty of choices when it comes to the BMW 5 Series but the German manufacturer is branching out into new territory with the Active Hybrid 5. The first hybrid BMW to be sold in the UK, it is intended to offer a more efficient alternative to petrol for those who can't face the idea of plumping for diesel. 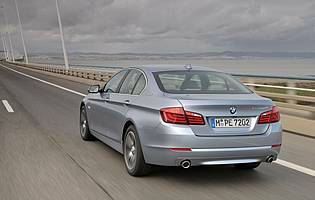 Saloons are the cornerstone of BMW's range so it is hardly surprising that the 5 Series in all guises is superb in so many departments. For many it is the default choice in the mid-sized premium segment and the vast choice of power plants and specifications means there is something for almost everyone. However the lack of a hybrid model has allowed a particular rival to claim an advantage. The Active Hybrid 5 aims to address that with a combination of petrol and electric power. The starting point is the 3.0-litre twin-turbocharged petrol engine already seen in other BMWs including the 5 Series, but here it is combined with a compact electric motor that is sandwiched between the engine and transmission. Unlike many hybrids the Active Hybrid 5 remains two-wheel drive; the petrol engine and electric motor both send their power to the rear wheels. Not only does this stay faithful to BMW's philosophy it also avoids any efficiency losses from sending power to the front wheels. 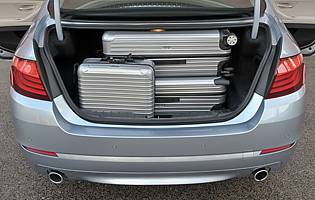 The battery pack sits at the back of the boot, just behind the rear seats, and although this does impact on luggage space a little, there is still plenty of space. Aside from some unique alloy wheels and unsightly C-pillar badges the Active Hybrid 5 looks just like any other 5 – and is all the better for that. BMW has pulled off a remarkable feat in delivering a hybrid that requires few if any compromises on the part of the owner and in many respects has some advantages not seen in the rest of the range. 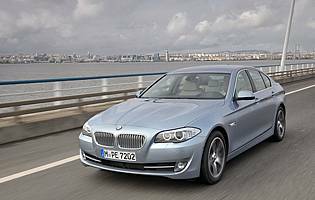 A diesel 5 Series may offer better overall value but for petrol lovers it has a lot to offer. Compared to other petrol models the Hybrid 5 offers a remarkable blend of performance and low running costs. In comparison to the more powerful diesels it is slightly more expensive, although this could be offset by the price difference in fuels. In relative terms however, outside of the purchase price this will be pretty cheap to run given its performance. As with the rest of the range, this 5 Series offers plenty of room for four adults. Head and legroom in the rear is good for a car in this class, while oddment storage space is plentiful both fore and aft. The car's boot is also a good size, although reduced slightly over the standard car due to the battery pack. 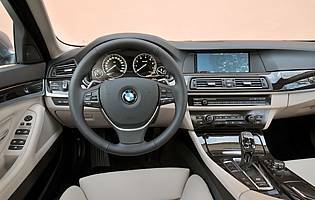 With BMW's i-Drive technology having steadily improved over time, it's now become surprisingly intuitive, and controls many of the car's functions: ventilation, audio, satnav, telephone. The car's the auto gearlever requires a little practice to be fully comfortable with, but this is the only ergonomic quirk in an otherwise well thought out cabin. Unsurprisingly the Hybrid 5 scores very well here. In EV mode it is extremely hushed, and even when the petrol engine kicks in there is very little intrusion. The same goes for the ride quality, especially when fitted with the adaptive damping. There is no issue over the amount of space in the cabin, and the driving position offers plenty of adjustment thanks in part to the wide range of seat adjustments. This sixth generation car is likely to be no less popular than its predecessor. As such, a quality alarm and immobiliser package is available plus a keyless entry and start feature, while it would be unwise to dismiss a supplementary tracking device if you value your pride and joy. From a full compliment of airbags to a sophisticated electronic traction and a stability package, nothing has been left to chance. There's no doubting the car's safety credentials, and any fears over the additional battery packs can be put to rest by their location in the safest part of the car. The key factor in the Active Hybrid 5's driving appeal is that it delivers the entertaining experience expected of a 5 Series whilst adding the extra economy and electric operation of the hybrid technology. With even more power than the 535i the Hybrid 5 is unquestionably fast, accelerating with real vigour from all engine speeds. The transmission operates extremely well whether manually or automatically operated and the handling and grip appear unaffected over the standard car. The flip side is that in EcoPro mode (which offers maximum efficiency) the Hybrid 5 often travels in near-silence, smoothness and remarkably efficiency. Family duties will be no problem for the Hybrid 5, as with the standard car. There is plenty of space in all seats and the quality materials will stand up well to sticky fingers. The only potential downside is the saloon boot is smaller than the standard car and therefore potentially less able to cope with cumbersome buggies. There's no question that it's an easy car to drive and, with the variable rate steering, it requires little effort to park. Anyone on a budget might prefer the 3 Series, which is obviously smaller and less expensive to buy and run. Quality is not something BMW has been troubled by in recent years and the Active Hybrid 5 is clearly a high quality product inside and out. The materials are of a high standard and the fit and finish is excellent. Image has never been a problem for BMW either, and even with this eco-minded hybrid model it retains the image of a driving machine. With four generously sized doors access for passengers is the work of a moment. The roof height is not an issue and there is plenty of space in the footwells to make access easy. The same can be said for the boot which can open remotely or even with gesture control. One downside is that with the battery pack located between the rear seats and the boot there is no longer any access from the rear seats. With almost no visual differences between the Active Hybrid 5 and the rest of the range, the same tasteful rules apply. Darker solid colours and metallics work well, yet a well-chosen bolder shade can also look very smart. On the inside the Active Hybrid 5 comes with high-gloss wood trim and leather as standard, giving a very high quality feel to the cabin. Once you're familiar with its size parking rarely proves to be a challenge. The included parking sensors help, while the optional active steering function greatly reduces the effort required. The optional reverse parking camera is an added bonus. Run flat tyres fitted as standard. Petrol engine options – 2.0-litre (184bhp and 245bhp); 3.0-litre (272bhp and 306bhp); 4.4-litre (407bhp). Diesel engine options – 2.0-litre (184bhp); 3.0-litre (204bhp, 245bhp and 299bhp). Transmission options: six-speed manual gearbox, plus optional eight-speed auto gearbox (standard for 550i). Trim levels: SE, M Sport, Active Hybrid 5, M5.